Alternating streaks of dark green and pale green are not uncommon in wheat in the spring and often follow the path of the nitrogen fertilizer application made earlier in the season. While very noticeable in wheat, ununiform application of fertilizer is a common problem in many crops where granular fertilizer applications have been made with spinner spreaders. 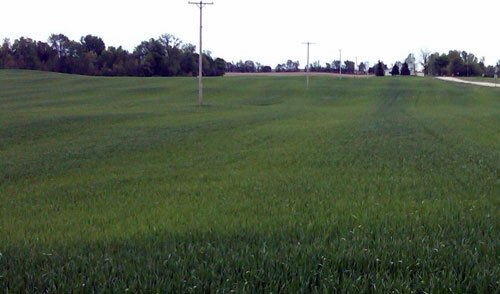 Green and yellow streaks in wheat following fertilizer application (MSU photo). Many of these problems can be traced back to three sources: operator error, poor quality fertilizer, and, occasionally, a misadjusted spreader. The first step to diagnosing potential spreader problems is to obtain a copy of the operator’s manual for the spreader being used. In the operators manual there will be a wealth of information such as width of spread, proper hitch height, and operating speed as well as important safety information. After reviewing the operator’s manual, observe the operator making an application. Give particular attention to the operating speed of the spinners. Many drawn spreaders have mechanically driven spinners operating from the PTO of a tractor. The engine RPMs must be maintained at PTO operating speed. For hydraulic-driven units, adequate pressure must be maintained in the hydraulic system to drive the spinners at rated speed. Check to see if the width of application is being maintained by the operator. Light bars, auto steer and other navigation aids can assist the operator in maintaining application width. Confirm that the selected width is appropriate for the spreader and the material being spread. Hitch height is an important detail on drawn spreaders as it affects the pitch of the spinners at the rear of the machine. Consult the operator’s manual for the machine being used. Wind speed should be less than 5 mph when making applications. Strong winds and especially gusting winds can significantly alter the spread pattern. The quality of material being spread can affect spread pattern, particularly material that contains a significant amount of very fine particles (dust) or large clumps. Large clumps can partially block off the opening under the gate, reducing the rate of application by reducing flow. To avoid large clumps from forming, keep fertilizer as dry as possible. Material that contains a significant amount of dust and small particles will be more difficult to spread evenly with spinner-type spreaders (it’s hard to throw dust). To avoid making fertilizer dust, reduce handling as much as practical, especially with augers. Always consult the operator’s manual before making adjustments to a spreader. Begin by examining the spreader for mechanical issues such as heavily corroded or missing parts. Second, check for bent components such as the flow divider on double spinner models or a bent spinner support frame. To check the spread pattern, obtain a pattern test kit. A pattern test kit will contain catch pans with dividers that fit in the bottoms of the pan. These dividers are in place to keep particles from bouncing out of the pan. Set up a test course on a level field with one pan in the center of the course that will be straddled by the spreader; the rest of the pans should be evenly spaced in a line perpendicular to the direction the spreader will travel. Use at least 10 pans for the effective spread width with additional pans placed beyond the effective spread width so any material thrown beyond the intended spread width will be collected. Many test kits use a series of tubes where material collected in the pans is placed for easy visual comparison – be aware that visual inspection can be misleading if fertilizer particles are not of uniform size. Weight of material collected from the pans will typically be a more accurate measurement.